These are the three Dubliners who were arrested in an underground car park when elite gardai foiled an alleged plot to kill The Monk's brother Patsy Hutch. 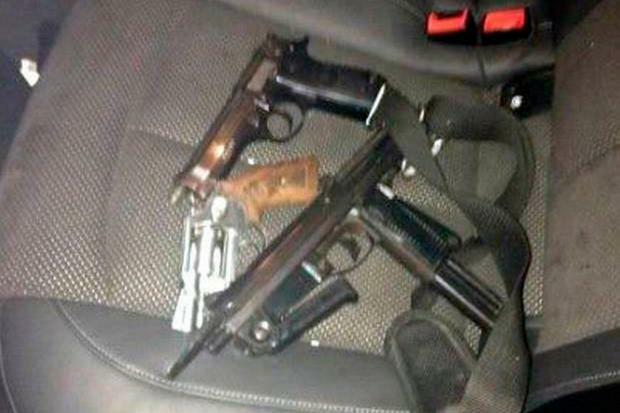 A number of deadly weapons, which included a sub-machine gun, were seized when gardai arrested the three men early on Saturday morning. They included a former British soldier who saw active service in Iraq and Afghanistan. All three were still being questioned last night about a conspiracy to murder Patsy Hutch near his north inner city home. A fourth man - a 41-year-old New INLA figure from Tallaght - is also being detained for the same offence. He was arrested driving a car close to the scene of the other arrests. Senior garda sources last night said the Tallaght man was suspected of sourcing weapons, vehicles and personnel to be used in the murder venture for the Kinahan cartel. This is at least the fifth time that Patsy Hutch's life has been saved since the capital's deadly feud kicked off. Two of the men in garda custody last night were brothers Gary Thompson (34) and Glen Thompson (23), of Plunkett Drive, Finglas. Glen Thompson was convicted in 2014 of selling cocaine and ecstasy to undercover gardai on three occasions between December 2012 and April 2013. While well known to gardai, he does not have anything like the serious criminal pedigree of his older brother. Gary Thompson was charged with the 2009 gangland gun murder of criminal Graham McNally, but the charges were dropped without explanation at the Central Criminal Court in December last year. Members of the Finglas mob that Gary Thompson is closely associated with are also the chief suspects in the murder of Graham McNally's brother, Alan (36), who was shot dead in the Cappagh Nua pub in Finglas, north Dublin, on February 2, 2012. The assassination team involved in both McNally murders are also the chief suspects for masterminding the execution of gangster Paul 'Farmer' Martin in the Jolly Toper pub in Finglas in 2008. In a bizarre court application in 2010, Gary Thompson was one of five people who went to Dublin District Court to have DNA samples returned to them or destroyed. The material was gathered as part of investigations into the killings of Martin and McNally. Saturday's arrests in the underground car park of the Belmont apartments in Gardiner Street shortly after 7.30am followed a massive surveillance operation involving hundreds of gardai which had been ongoing for weeks. The Herald can reveal that the former soldier is Robert Brown, who spent many years in the British Army and served in Iraq and Afghanistan. Brown (35) is understood to be originally from Hardwicke Street flats in Dublin's north inner city. He was previously convicted of stealing €17,000 from a Securicor van driver in Parnell Street in January 2001 when he was aged just 18. The three men were arrested in the underground car park when heavily armed members of the Emergency Response Unit (ERU) swooped on a van . The move came after a major investigation by the Drugs and Organised Crime Bureau (DOCB). Gardai recovered a cache of weapons including a sub-machine gun, a semi-automatic handgun and a revolver. Further searches of the vehicle led to the discovery of a pistol. Shortly after the arrests were made, the 41-year-old Tallaght New INLA figure who is suspected of organising the murder plot was arrested as he drove around the north inner city. The feared thug is a close associate of Kinahan cartel hitman Eamonn Cumberton (30) and turned up every day to support his pal in his Special Criminal Court when Cumberton was convicted of the feud murder of Michael Barr. Follow-up searches of a Tallaght property on Saturday linked to the thug yielded a silencer and a quantity of ammunition. Detectives also recovered a machine gun when they searched a Finglas property linked to Gary Thompson. The large-scale surveillance operation was ongoing for several weeks after gardai received intelligence that the Kinahan cartel was planning to murder Patsy Hutch, the brother of 'The Monk'. On Saturday morning, the property of a distant Hutch relative was damaged in an incident which gardai believe was an attempt by the hit team to lure Patsy Hutch out of his Champions Avenue Home. But before the team could carry out the hit, elite gardai swooped on the suspects. Sources said that gardai have intelligence that the Kinahan cartel have "a full-time network of spies working for them who get paid for information on members of the Hutch family". Gardai are understood to be planning more arrests in the coming weeks. The arrest operation was welcomed by the senior officer in charge of the investigation. Assistant Commissioner John O'Driscoll said: "Those within the world of organised crime who display a total disregard for human life remain within our focus and we are determined to cause them to be arrested, charged and where the courts determine there is sufficient evidence, convicted and incarcerated within our prisons".